Two intrinsic attributes — an indomitable fighting spirit, and the ability to remain cool and produce her best in a pressure situation — came to the aid of Indian shuttle queen Saina Nehwal, as she withstood a late charge from Thailand’s Ratchanok Intanon to notch a 21-19, 21-19 victory in a 49-minute long women’s singles semi-final of the Indonesia Masters World Tour badminton championships in Jakarta. The unseeded Saina’s spirited performance against the No 4 seed and 2013 world champion took her career head-to-head tally against the Thai to 9-5, and also secured for the World No 12 the right to take on the world’s top player and No 1 seed, Tai Tzu Ying of Chinese Taipei, in Sunday’s final at the Istora Senayan. Tai had to fight all the way to subdue Chinese left-hander, He Bingjiao, the No 8 seed, by a 19-21, 21-15, 21-15 scoreline in 50 minutes. Sadly, the giant-killing run of the youthful Indian men’s doubles combination of Satwiksairaj Rankireddy and Chirag Shetty came to an end at the penultimate stage of the competition. Unable to emulate their compatriot’s feat, the youngsters met their Waterloo at the hands of top-seeded Indonesians Marcus Fernaldi Gideon and Kevin Sanjaya Sukamuljo, being brushed aside at 21-14, 21-11 in exactly half an hour. The Indian pair had earlier produced their career-best performance in the $325,000 prize money tournament, knocking out the eighth-seeded Japanese duo of Takuto Inoue and Yuki Kaneko in their opening outing, and also sidelining the fourth-seeded Danish duo of Mads Pieler Kolding and Mads Conrad-Petersen in the quarter-finals on Friday. Indonesian interest in the men’s singles remained strong, with the pint-sized dynamo, Anthony Sinisuka Ginting barreling into the final at the expense of No 6 seed, Chou Tien Chen of Chinese Taipei by a 21-16, 13-21, 21-12 verdict in five minutes over the hour mark. 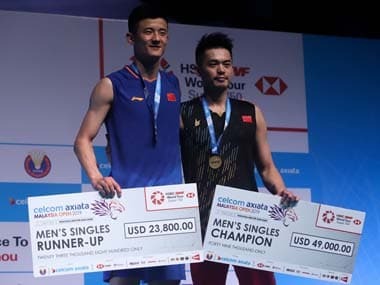 The supremely fit local lad once again rode on the back of the raucous crowd support he had received at the refurbished Senayan Sports Complex when he had administered the knockout punch to 2016 Olympic gold medallist Chen Long of China a day earlier. The energetic young Indonesian’s road to his first World Tour (formerly Superseries) title was further cleared when the last remaining seeded star, No 4 ranked Son Wan Ho of South Korea, was shown the exit door by the unseeded Japanese, Kazumasa Sakai, by a 21-18, 20-22, 21-15 scoreline in the day’s longest match, a fierce battle of attrition lasting 69 minutes. Eventually, Sakai’s barrage of consistent returns proved a mite too much for even Son’s renowned defence to handle. Ginting, who idolises his country’s former world champion and backhand specialist, Taufik Hidayat, will go into Sunday’s final with a small psychological advantage. The 21-year-old Indonesian, occupying the 16th spot on the Badminton World Federation (BWF) rankings, has bested the Japanese, six years his senior, on the only previous occasion the two have clashed — in the Hong Kong Open in November 2015. Saina’s duel with Intanon was the only one of Saturday’s four singles semi-finals that ended by the short route, in two straight games. That statistic, however, gives an erroneous impression that the Indian’s route to the final was shorn of obstacles. The truth of the matter is that she had to work very hard to stay in the lengthy rallies, while countering all of Intanon’s wily, deceptive strokes. The fact that these strokes failed to deceive Saina gave the Indian the ability to play every point on an even footing. An idea of just how competitive the match was, and how prolonged the rallies were, can be had from a comparison of the time taken for the two women’s semi-final encounters. Whereas Saina and Intanon stretched their frames to every corner of the court for 49 minutes, and played rallies that averaged 16-18 strokes, Tai and Bingjiao occupied the court for only one minute longer while trading crisp, short rallies that rarely went over ten strokes. Saina was behind Intanon for much of the opening stanza, trailing 1-3 and 6-10, before going into the mid-game break with a small 9-11 deficit. The Thai enlarged her advantage to 13-10 before the Indian made a decisive move, charging into the lead with a four-point reel. 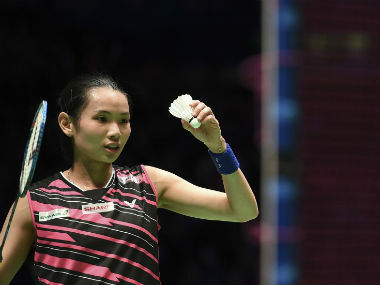 Several exhausting exchanges followed, much to the capacity crowd’s delight, and Intanon went to 18-16 before Saina showed her mental toughness, grabbing five of the final six points. Buoyed by her success in the first game, the Hyderabad-based Indian went on the rampage from the start of Game 2, building up what seemed to be a potentially match-winning 9-2 lead. Intanon narrowed the gap to 8-10 before Saina put together another five-point reel to go to 15-8, and then 17-11. But Intanon was not yet done. As Saina showed traces of nerves for the first time in the match, the Thai played some of her best badminton to repeatedly catch her rival on the wrong foot, and storm to 17-all. Then the scores inched to 18-all, and it was still anyone’s game. Amidst tension that was almost palpable, the Indian kept her nerve and grabbed the vital ace from 20-19 that took her into the summit clash. The match conclusively showed how the rehabilitation efforts of the Indian, following her ankle injury incurred in the closing weeks of the year gone by, have borne fruit. Saina is still looked up to by her peers as one of the hardest working players on the international circuit; and the fact that she seems to have got back to full fitness, following her knee reconstruction surgery in October 2016, and the ankle trouble in December 2017, will give her a fine chance of taking the title in the city where she first made her mark nearly a decade ago, by winning the Indonesian Open. Saina’s rival for the title, Tai, is one of the few players still in the churn to boast a superior head-to-head record. The 23-year-old Taiwanese ace not only has a four-year age advantage, but also has a 8-5 lead over their 13 career meetings. The troublesome statistic, from an Indian perspective, is that Tai has won their last six encounters, stretching back three years, to the November 2014 Hong Kong Open. Indeed, the Indian has not been able to unravel the Taiwanese mystique; and while the heart would love it if she were able to turn the Tai tide, the mind says that Saina will have to play out of her skin, at a level even higher than she did against compatriot PV Sindhu and Ratchanok Intanon in her two previous matches, if she is to stand on the topmost rung of the rostrum at the Istora Senayan on Sunday.